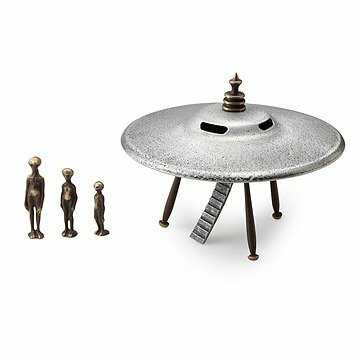 Bring home a galactic work of art with this eye-catching alien family. Making peace with the pod people is easy when you can simply invite alien lifeforms right into your home. Zooming by in their flying saucer, this family of otherworldly characters aren't interested in becoming Earth's new overlords, but warning: they've been known to take over the conversation. Either a grown-up toy or a youthful work of art, this galactic artifact comes from Michigan artist Scott Nelles. He uses a sand mixture to create an out-of-this-world artwork that he insists was inspired by a chance sighting of the real deal. He then pours molten bronze and recycled aluminum into the forms to bring his space pod and its little "green" beings and child to life. Nelles Sculpture is coated with a clear lacquer that can be damaged with abrasive cleansers, metal polish or steel wool. If you must, you may use mild soap and water and a soft brush. Normally, my sculptures only need to be dusted.